If you've got a nice long black dress, then this Moon Phases Long Crescent pendant is the perfect accessory to complete your look and outfit! Also goes perfect with a deep plunging, yet still classy neckline if you can pull it off! A great way to showcase the Triple Moon Goddess symbol. Moon Phases Long Crescent pendant presents moon phases carved in alloy with strong texture. This Moon Phases Long Crescent pendant showcasing the Triple Moon Goddess is made of solid metal imitation of antique silver. Even the thinnest parts are very strong and solid and resistant to breakages such as falls from heights. 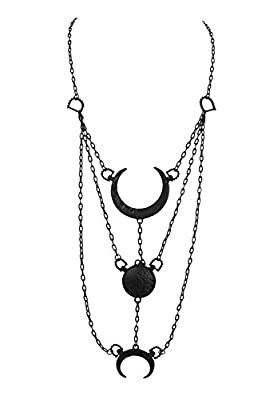 This necklace presents moon phases carved in alloy with strong texture. All connected with long chain. Moon jewellery in antique silver colour. It will look best with long, black dresses and black fashion clothes.